1. Preheat oven to 200°C, gas mark 6. Mix the sesame oil with the soy and hoisin sauces, and 1 tbsp of the five spice. Rub this all over the pork and leave to marinate covered in the fridge for at least 1 hour, but preferably overnight. 2. Pour the vinegar into a small saucepan, add the sugar and heat until the sugar has totally dissolved. Stir in the chillies and garlic. Take the pan off the heat and leave to cool completely. and rest for 10 minutes. 4. Meanwhile, place the sweet potato chunks in a large bowl and toss in the garlic oil and remaining five spice. Tip the wedges on to a baking tray and roast in the same oven as the pork for 40 minutes until softened. 5. Stir the coriander stalks into the chilli sauce. 6. Cut the pork into 1cm slices. 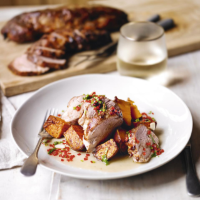 Divide the roasted sweet potatoes between the plates, top with pork slices, drizzle with the dressing, scatter over the coriander leaves and serve.